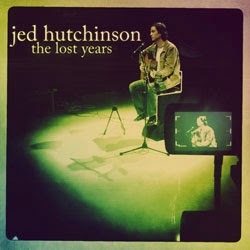 I've known Jed Hutchinson for a fair number of years, maybe eighteen. Anyway, we crossed that boundary when it became most of my life some years ago. There was a particular period in which we both lived in Sydney's Inner West. Actually, we even lived in the same building. There were times when we discussed running cables through his floor into my apartment for whatever it was that we got up to at the time. For Jed, this was the arse end of what he would later refer to as The Lost Years. I spent a lot of time sleeping on his sofa, even when my own bed was only a few metres away, which afforded me the opportunity to be there 'where and when the magic happened' a lot of the time. He had been in the area for a number of years before I came along, and had become something else other than the person I had known before. He'd grown in someways, and had been hurt and worn down in others. The story is longer than that, and I feel like you might need a starting point for the comparison, so I'll say that his capacity for speaking to the point of things concisely and poetically is equaled by few that I have met in my life. In this I am not talking about the way that he writes songs, which is a separate matter, because a lot of people can tap the vein when they put the effort in, but in his day-to-day when he reaches for words to tell you how he is feeling, or what's happening in his life, he often comes out with the way that I would hope to write it after editing. By that arse end of the lost years this only really came out when he was writing songs. The stress and exhaustion mentioned in the bio on his website had dug a hole, and that place where the words came from became a place that he only visited in private. He has recently released an EP named after that period of his life, which is comprised of a handful of songs from that period of his life, and In those six songs manages to cover most of the more salient points of what was going on. They're songs that are about the things that we do to each other, and the things that we do to ourselves, just because we don't really know how to be better. They resonate because they are a part of our own stories, and describe in detail the way that we operate or the way that we have been operated on, and we understand because the message is clear. Often so simply put that you wonder why it hasn't been put like that before. There are other songs that are waiting to be released. Songs that I know are there. I've heard them. Some of which are available here and there. Some of them are the rest of that particular story, and some are the stories that have happened since. I talk to the guy now, and I hear the familiar cadence and imagery rolling again in the way that he converses. He has easier access now to wherever he gets those words from than he did some years ago. Like all artists he still wants more though. Which is healthy. We should always strive to create more than we do, whatever quantitative and/or qualitative measures we choose to use. Right now though, the stuff is good, and there is more on the horizon, and I think it will get better. 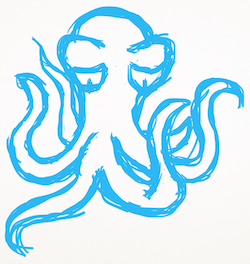 Sometimes we talk about his creative process, and where he is at, and it is clear that he has his own Octo-Hoff, but the momentum is forward. If you are interested in the bandwagon, and aren't sure where to get on, I wholeheartedly recommend Rapunzel, The Cowboy Song (Marching Along), and this fantastic Elliott Smith cover.